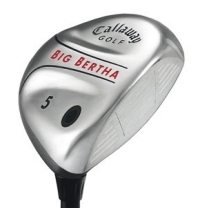 Big Bertha Stainless Steel Fairway Woods feature a modified version of the legendary Warbird sole for outstanding performance from any lie. Feel free to contact us at 1-800-282-4949 (773-463-8333) for pricing and any other questions you may have. In order to continue bringing you the lowest prices, we are prohibited from publishing our low prices on the website due to Minimum Advertised Pricing policies imposed by the manufacturers. Copyright© 2001-2008 Ace Pro Golf Shop. All rights reserved. Ace Pro Golf Shop has been serving the Chicago area for 20 years. from great brands like Callaway, TaylorMade, Titleist, Cleveland, Cobra, Mizuno, Ping & more. Visit our golf store or visit us online anytime.